Prelude: Hi everyone! Bought this game on release and have been tinkering around with a couple games. I figured the best way for me to actually stick with one game would be to write an AAR for it. It's been something I've been wanting to do in general for a while now, but this will be my first one... so please bear with me! DISCLAIMER: I'm rather notorious for starting things and not finishing them. So I'm giving you fair warning that I may never be able to finish this. Hopefully that won't happen this time! 7 basic starting Empires as opponents. As well as independent colonies having the ability to form new ones. Most auromation is set to suggestions, especially colonization to avoid collapsing my economy. Prologue: It had taken many years for the Zenox to become the world spanning technocracy that it is today. It was the discovery of an ancient datacore by a guild of researchers, engineers and scientists known as the Technocrat Council which led to almost all the advancements that brought the Zenox back into the stars. The idea that this group could lead the Zenox people to a new age of enlightenment was too great for the common man to deny and it was not too long before the world governments were forced to yield and unite giving the Council supreme power over all Zenox Affairs. 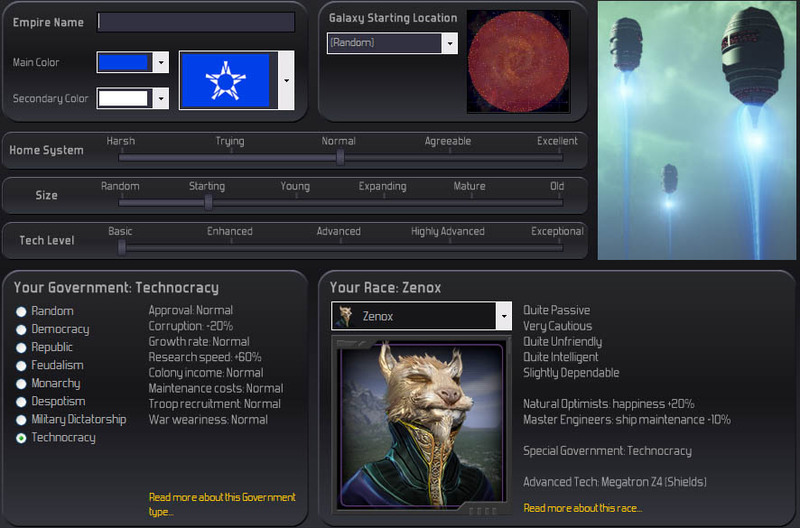 The Zenox Technocracy was born. Within a few short years a massive construction project was underway that saw the creation of Icebu 5 Spaceport, a small fleet of warp capable ships, as well as a number of off-world mining colonies. 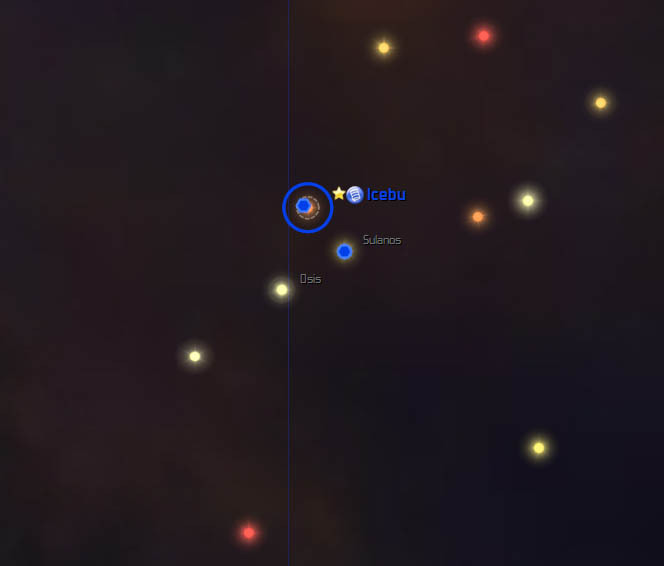 One of which was located in the not-too-distant system of Sulanos. Bu 2754, with their preliminary fleet ready, The Zenox Technocrats set their eyes on the planet Icebu II. Another fertile, continental planet with green rolling hills and warm blue oceans. Early surveys suggested that the planet had the resources to make Rephidium Ale. Though most of the Technocrat council was not particularly fond of the stuff. They were informed it was quite popular with the lower and middle classes who would be willing to pay a premium for the product. The Council was quick to draw up the plans to construct a Colony Ark of sorts, The 'Humble Rimrunner' which would transport Millions of eager Zenox volunteers to their new home. Their fleet of exploration vessels turned towards the stars, and it was not too long before one of the greatest discoveries in modern Zenox history was uncovered, right on their doorstep. On a small moon dubbed KB452, sat a planet which was inhabited by another, independent Zenox Civilization. The news sent shockwaves through the Technocracy. It had been theorized that the Zenox were not alone... but to find other groups of Zenox, so genetically similar was jarring, even for the council. Plans commenced quickly to establish communications with this long-lost group and hopefully bring it into the fold. However, it seems a band of pirates had taken up residence nearby the moon. 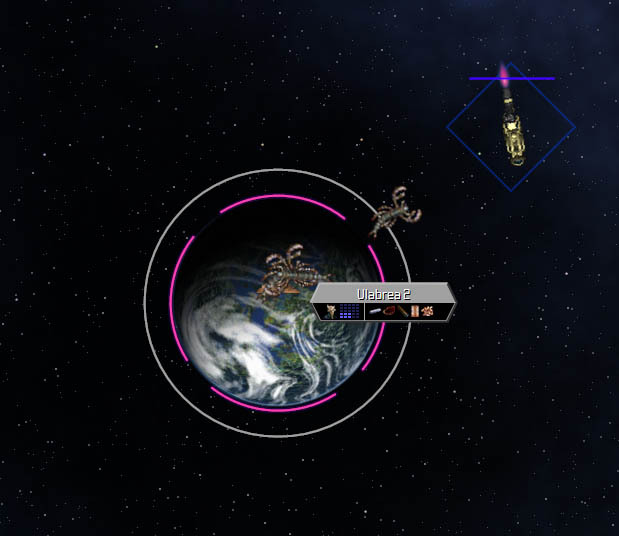 Though no evidence of hostility had been shown, the caution of the Technocrat Council won out and it was decided no colony ships would be sent until a sufficient enough force could be mounted to deal with the pirate base. A new fleet of Exploration and Defense ships would be constructed post haste! Shortly thereafter, another Colony of Zenox were discovered, this time developing in the ruins of Ulabrea 2, more developed than the first. The Technocrat council was puzzled and intrigued by this development. 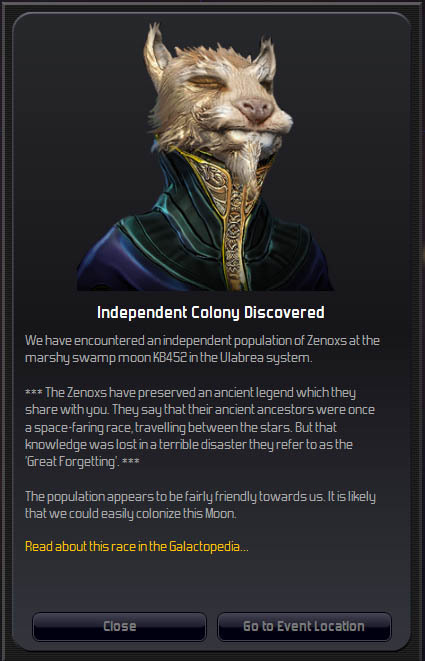 Was the rest of the galaxy also populated by errant Zenox brothers? Only time would tell. Known as the Menacing Fang Gangsters, they resembled giant bugs and tried their hand at extorting the Zenox Empire. They must have assumed that the Zenox Empire was as defenseless as the independent colonies of Ulabrea. But they would be proven very wrong, just as soon as the new fleet was ready. August 2754. Great celebrations were held as Colonization Day was marked when the first settlers landed on Icebu II. The Technocrat Council marked it as an auspicious day that would be one of the very first small steps the Zenox would take into the deep unknown of space. November 2754. Intrigued by the ruins found in Ulabrea, the exploration ship Starseeker of Icebu is ordered by the Technocrat Council to investigate the ruins. Captain Firatis himself leads the survey team in hopes of finding a discovery that would rival the original found by the Council itself. To their horror and dismay, they stumble into large swarm of giant space Kaltors nesting in the ruins. Never encountered before, the survey team was quickly devoured before the Kaltors took to Ulabrea's high orbit. 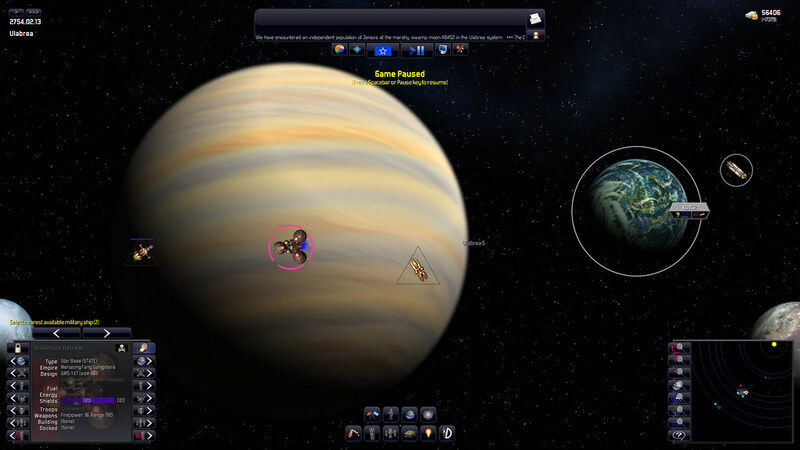 Starseeker reverses course and escapes. The navy still under construction to deal with the pirate threat would have to deal with these space beasts. Next: Pirate Assault and new discoveries! An excellent start, thanks for writing this AAR! 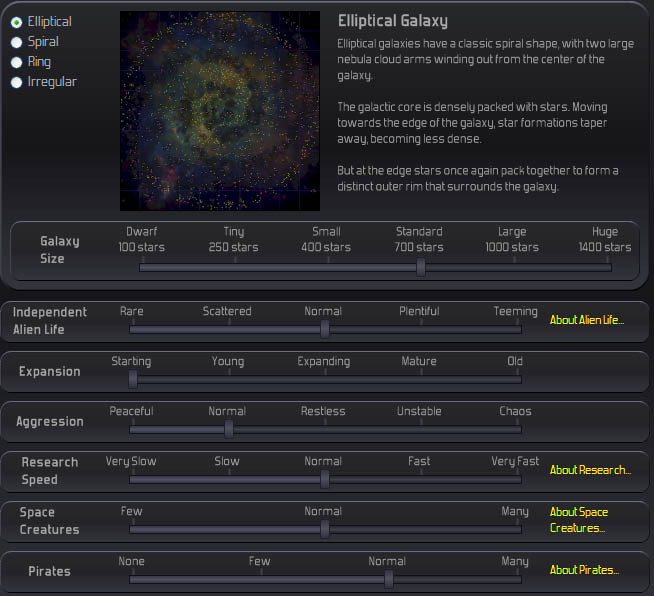 I am starting to wonder if I'm the only one who likes Very Slow Research and an Unstable or Restless galaxy. Thanks. Keep it up! Mid game and late game are most interesting usually. Erik, how large is the difference from normal to restless and unstable? Is diplomacy (getting treaties etc..) also affected?